The Royal Canadian Regiment (The RCR) was authorized as a unit of Canada's Permanent Force, now known as the Regular Force, on 21 December 1883. Created for the purpose of instructing the Canadian Militia, the Regiment was originally known as the Infantry School Corps. The Regiment's first garrisons, each occupied by a company plus the supported Instructional Cadre, were at Fredericton, St Jean (PQ) and Toronto. A fourth Company was established in London, Ontario, in 1888. Shortly after its formation, "C" Company of the Regiment saw action in the North-West Rebellion of 1885. In 1898, the Regiment provided men to the Yukon Field Force, which assisted with the policing of the Yukon Territory during the gold rush. May 1892 – "Canadian Regiment of Infantry"
May 1893 – "The Royal Regiment of Canadian Infantry"
April 1899 – "The Royal Canadian Regiment of Infantry"
The Royal Canadian Regiment formed Canada's first contingent to the South African War when, in 1899, a 2nd (Special Service) Battalion was formed for service in South Africa during 1899-1900. A 3rd (Special Service) Battalion was also formed to provide the Halifax garrison between 1900 and 1902. Both of these units were comprised primarily of Militia soldiers who volunteered to serve in The RCR for the purpose of the operational deployment or garrison task. In November 1901, the Regiment changed its name one more time, becoming "The Royal Canadian Regiment." At the outbreak of the First World War, The RCR was assembled at Halifax where Regimental Headquarters and six of the Regiment's ten companies had been located since 1905, having replaced the last British Army garrison in Canada. The RCR was brought up to wartime strength in late 1914 as it started its first task which was to serve for a year as the garrison battalion in Bermuda until August 1915. The RCR then proceeded to England and onward to France as a battalion of the 7th Canadian Infantry Brigade in the 3rd Canadian Infantry Division. 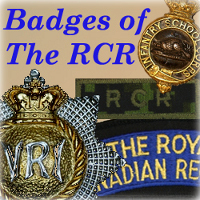 The RCR was awarded 16 battle honours for its actions during the First World War, including the Somme 1916, Vimy Ridge and the Pursuit to Mons. One member of The RCR, Lieutenant Milton Fowler Gregg, was awarded the Victoria Cross. 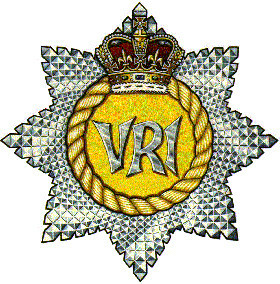 In 1919, the Regiment received a singular honour when King George V granted the Regiment the right to wear Queen Victoria's cypher – "VRI" – on its buttons and badges in perpetuity in recognition of its service in the First World War. This made the RCR the only Commonwealth regiment to wear a deceased sovereign's cypher with no requirement to change cyphers following the coronation of a new King or Queen. The RCR sailed for England shortly after the start of the Second World War where it trained for three years as a battalion of the 1st Canadian Infantry Brigade of the 1st Canadian Infantry Division. The Regiment entered combat when it landed on the beaches of Sicily on 10 July 1943 – a date still commemorated within the Regiment as "Pachino Day." The RCR fought their way through Sicily and Italy over almost 18 months including participation in the battles at Ortona, the Hitler Line at Pontecorvo and the Gothic Line on the Adriatic coast. In February, 1945, The RCR joined the final push to liberate Northwest Europe, fighting their last battle at Apeldoorn, Holland. In the closing days of the war, a second battalion of the Regiment was created in Canada, its planned employment being in the Pacific Force. With the capitulation of Japan, this requirement disappeared and, following the return and disbandment of the overseas battalion, the newly created 2nd Battalion became the single battalion of The Royal Canadian Regiment in the post-war Canadian Army. On the outbreak of the Korean War, The RCR still consisted of a single Regular Force battalion. During the three years of the war, two new battalions would be formed for the Special Force which fought in Korea, and all three battalions would serve in Korea in turn. The 2nd Battalion deployed in 1951, the 1st Battalion in 1952 and the 3rd Battalion in 1953. Following the Korean War, the 3rd Battalion was disbanded and the 2nd Battalion remained a unit of the Regular Force. On 1 October 1954, The Royal Canadian Regiment gained a Reserve Force battalion, formed by the amalgamation of The Canadian Fusiliers (City of London Regiment) (Machine Gun) and The Oxford Rifles. This new unit was designated the London and Oxford Fusiliers (3rd Battalion, The Royal Canadian Regiment). The Oxford Rifles originated in Woodstock, Ontario, on 14 August 1863, when the '"Twenty-second Battalion Volunteer Militia Rifles, Canada" or "The Oxford Rifles"' was authorized. In its early years, the unit was called out for service on the St Clair frontier during the Fenian Raids in 1866. The unit also provided some soldiers to the Canadian Contingents for South Africa. From 1920 until 1936, the unit briefly had a two-battalion structure, with one battalion part of the Non-Permanent Active Militia and the second battalion on the Reserve establishment (i.e, without personnel). During the Second World War, the 1st Battalion, The Oxford Rifles, CASF, was mobilized for active service in March 1942. It served in Canada in a home defence role until January 1945 when it embarked for Britain where it was disbanded in England later that month. Having undergone several changes in naming, the regiment was redesignated The Oxford Rifles on 1 June 1945. On 1 October 1954, it was amalgamated with 'The Canadian Fusiliers (City of London Regiment) (Machine Gun) and redesignated 'The London and Oxford Fusiliers (3rd Battalion, The Royal Canadian Regiment)'. The Oxford Rifles perpetuated the 71st and 168th Canadian Infantry Battalions of the Canadian Expeditionary Force and carried the honours, awards and accomplishments of those units into the regimental history of The RCR. The Canadian Fusiliers (City of London Regiment) (Machine Gun) originated in London, Ontario on 27 April 1866 as the 7th Battalion Infantry, "Prince Arthur's Own". During the regiment's early years, two companies were called out on active service in April 1870 during the Fenian Raids, serving on the St. Clair frontier. The unit also mobilized in 1885, serving in the Alberta column of the North West Field Force and provided troops to the Canadian Contingents in the South African War. Undergoing several changes of name, including a brief period as a three-battalion regiment titled the Western Ontario Regiment during the early 1920s, the unit was designated The Canadian Fusiliers (City of London Regiment) on 1 August 1924.21 On 15 December 1936 it was amalgamated with the 'Headquarters' and 'A Company' of the 2nd Machine Gun Battalion, CMGC, and redesignated The Canadian Fusiliers (City of London Regiment) (Machine Gun). During the Second World War, the regiment formed a second battalion; the 1st Battalion served as part of the Canadian Active Service Force (CASF) and the 2nd Battalion remained in the Reserve establishment. The 1st Battalion, The Canadian Fusiliers (City of London Regiment), CASF, was mobilized in 1942 and served on home defence duties as part of Pacific Command, taking part in the August 1943 expedition to Kiska, Alaska, with the 13th Canadian Infantry Brigade Group. The unit arrived in Britain in May 1944 where it was redesignated the 2nd Canadian Infantry Training Battalion, Type A (Canadian Fusiliers), CASF, and remained so until being disbanded in August 1945. Following the Second World War, the Reserve battalion of the Canadian Fusiliers regained its single-battalion designation: The Canadian Fusiliers (City of London Regiment) (Machine Gun). On 1 October 1954, it was amalgamated with 'The Oxford Rifles. The Canadian Fusiliers perpetuated the 1st, 33rd and 142nd Canadian Infantry Battalions of the Canadian Expeditionary Force and carried the honours, awards and accomplishments of those units into the regimental history of The RCR. The 2nd Machine Gun Battalion, CMGC, of the Canadian Militia originated when the 2nd Machine Gun Brigade, CMGC was authorized on 1 June 1919. The battalion was disbanded on 14 December 1936 with its HQ and companies amalgamating with a number of Militia units. The 2nd Machine Gun Battalion, CMGC, of the Canadian Militia perpetuated the 2nd Machine Gun Battalion, CMGC, of the Canadian Expeditionary Force and carried the honours, awards and accomplishments of this unit into the regimental history of The RCR. 1st Canadian Infantry Battalion, which fought in France and Flanders as part of the 1st Infantry Brigade, 1st Canadian Division until the end of the war. 33rd Canadian Infantry Battalion, which provided reinforcements to the CEF and was later absorbed by the 36th "Overseas" Battalion, CEF. 71st Canadian Infantry Battalion, which provided reinforcements to the CEF and was later absorbed by the 44th, 54th and 74th "Overseas" Battalion(s), CEF. 142nd Canadian Infantry Battalion, which provided reinforcements to the CEF and was later absorbed by the 23rd Reserve Battalion, CEF. 168th Canadian Infantry Battalion, which provided reinforcements to the CEF and was later absorbed by the 4th Reserve Battalion, CEF, and the 6th Reserve Battalion, CEF. 2nd Battalion, CMGC, CEF, which was organized in France in March 1918 from the 4th, 5th, 6th and 14th Canadian Machine Gun Companies. It provided machine gun support to the 2nd Canadian Division in France and Flanders until the end of the war. Disbanded on 15 November 1920. In 1958, formal amalgamation with The Royal Canadian Regiment was completed and the Reserve battalion was redesignated the 3rd Battalion, The Royal Canadian Regiment (London and Oxford Fusiliers). In 1959, the Regimental Executive Committee of The RCR confirmed the receipt of formal authority from the Army by which the Regiment would carry all of the perpetuations of the amalgamated regiments; to include the "1st, 33rd, 71st, 142nd and 168th CEF Battalions and 2nd M.G. Bn. 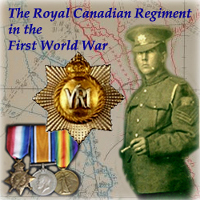 CEF"
One member of the 1st Canadian Infantry Battalion, Lieutenant Frederick William Campbell, was awarded the Victoria Cross. Although chronologically earlier than Milton Gregg's award, it was through the amalgamation of Regiments in 1954 that this became the second such award to be commemorated with the history of The RCR. In addition to the recognition of Campbell's VC by The RCR, the Regiment maintains an equal responsibility to recognize all other honours and awards received by members of the perpetuated units. The 3rd Battalion, The Royal Canadian Regiment (London and Oxford Fusiliers) was established in 1954 with garrisons in London and Woodstock. A third location in Stratford was established in 1965, followed five years later with the close of the Woodstock garrison in 1970. In 1970, with a major reorganization of the Army, the Reserve battalion was re-designated as the 4th Battalion, The RCR, when a new 3rd Battalion was created in the Regular Force establishment. Since 1970, the Reserve Battalion has maintained its garrisons in London and Stratford, Ontario. Throughout the 1960s, 70s and 80s, and into the 1990s, the Regular Force battalions of The Royal Canadian Regiment served in Canada, Germany and on 13 separate unit rotations in Cyprus. Between 1977 and 1995, the 3rd Commando of the Canadian Airborne Regiment was also a regimental unit of The RCR. As well, a regimental Battle School which trained new infantry soldiers for the Regular Force battalions existed as a separate CF unit between 1978 and 1997. In 1983, the Regiment marked its centenary with events in all battalions and a major reunion gathering in London, Ontario. In July of that year the Colonel-in-Chief, His Royal Highness The Prince Philip, reviewed and addressed the Regiment on parade in London during a trooping of the colours from all four battalions and the affiliated 3 (Airborne) Commando. The Royal Canadian Regiment has served Canada at home and abroad; including domestic operations ranging from assistance to civil authority during the FLQ Crisis (1970), Akwesasne (1990) and Oka (1990) to emergency response at the Manitoba Floods (1997), the Ice Storm (1998), and Hurricane Juan in Halifax (2003). It was for Op RECUPERATION, the response to the Ice Storm in 1998, that formed elements of all four battalions of the Regiment were deployed simultaneously on a single operation. Since the 1990s, the Regular Force battalions of The RCR have provided formed units and sub-units to Canada's missions in the first Gulf War, the Former Yugoslavia, Africa and Afghanistan. All four battalions and the Regiment's extra-regimentally employed (ERE) personnel have provided individual augmentation to many of Canada's UN and NATO missions. The Afghanistan mission has included the deployment of formed battle groups based on each of the three Regular Force battalions, and the 4th Battalion has seen the deployment of up to 30 of its officers, NCOs and soldiers at a time depending on available tasks in each operational cycle. The Royal Canadian Regiment is Canada's senior Regular Force infantry regiment. Through its amalgamated regiments, the regimental lineage of The RCR dates from 14 August 1863; although 21 December 1883, the creation of the Infantry School Corps, is celebrated as the regimental birthday by regimental tradition. The four battalions of The Royal Canadian Regiment continue to serve Canada, with regimental garrisons at Wolseley Barracks (4RCR and The RCR Museum), CFB Petawawa (Regimental HQ, 1RCR, and 3RCR) and CFB Gagetown (2RCR). Extra-Regimentally Employed Royal Canadians serve in units, training establishments and headquarters across the Canadian Armed Forces, both in Canada and abroad. "An eight-pointed diamond cut star; upon the star a raised circle surmounted by the crown; within the raised circle, the block letters "VRI", the Imperial Cypher of Queen Victoria."